We love the open living spaces, the double-height ceiling, the tropical resort vibe, and the tree house for kids! This sprawling family home is filled with a flurry of activities on a weekday morning. Children come and go, pets jump up to greet guests, and lunch is cooked, yet the house remains calm, relaxing, and cool—much like a tropical resort, only located in the middle of a bustling city. Cara and Edwin moved here 12 years ago after living as newlyweds in a condo unit. “When I gave birth to my eldest, parang the condo was too small, and so we decided to move to a house. We built it even when we were just starting out, and we were on a really tight budget,” says Cara. The construction took only six months, with Cara at the helm of the interior design, and her friend Oscar Bonifacio working on the architecture. The end result is this all-white modern house washed in light, with a second-level bridgeway that joins two bedroom areas, allowing both living and dining to have a double-volume ceiling. The spaces were decorated slowly, over time, as “I have a slow process of accumulating things over the years,” Cara admits. 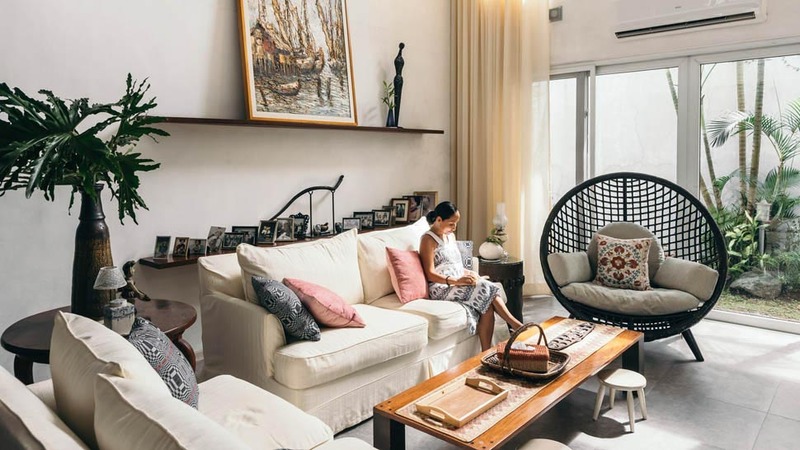 And her years of working at Focus Global—handling major international home brands such as Siematic, Ethan Allen, Miele, and Oster—coupled with frequent travels have allowed her to furnish her home with a tasteful mix of contemporary furniture and Asian-Filipino décor. As their children grow, the house continues to evolve; their most recent addition is the huge bed in the master bedroom, but there are more upcoming improvements. “That’s my husband’s and my motto in life: Make it happen. Anything we dream of, we will create it. It’s a life project we do together, so it’s always fun,” Cara says with a smile.